With the Stanley Cup Finals looming, here’s why it’ll be worth staying up into the early hours of the morning. “You know, ‘boring’ I think is ten years without a title: that’s very boring”. 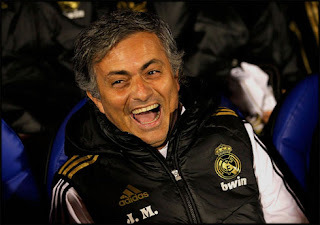 Following a drab goalless draw at the Emirates that all but crowned his side Premier League Champions, Jose Mourinho couldn’t help but bite back to bitter accusations that his Chelsea team weren’t exciting enough to lay claim to the throne of English football. That uneventful game in a small pocket of North London was, however, a microcosm of Chelsea’s successful season. The Blues were never set up to entertain, as football has become a business where success is defined by the immediacy of results, and Mourinho was only ever concerned with getting the job done. Get the job done he did, and one doubts Mourinho and Co. have been too troubled by their ‘boring’ label while looking at themselves in the reflection of their Premier League trophy. However, when the Champions of English football are being rendered uninspiring, one cannot help but wonder if the result focus of the business will begin to overshadow the primary duty of the sport: to entertain. Given that it is statistically the most popular, it is difficult to contend that football is not the most exciting sport in the world. Popularity, however, is determined by simplicity, and football feeds the masses because it is the easiest to understand. Many would argue, however, that football lacks the physicality of rugby and American football, or is devoid of the mental strength and patience required to score an Ashes winning century on day five at The Oval. As an English-born eight year old moving to the outskirts of New York, football was all I really knew as it became a central part of my upbringing. I was soon to discover, however, what I still believe to be the most exciting and skilful sport in the world. Ice Hockey amalgamates the passion of football, the physicality of rugby, the hand eye coordination of cricket and baseball, and throws it all within the confines of a massive slab of ice. The rules are simple and probably do little to justify the title of ‘best sport in the world’. Two teams skate around the ice trying to put the puck into the other team’s goal, and whoever scores more is the winner. So how is this different from our experience of any other sport? Well, other sports move at a snail’s pace in comparison to the 20mph skating speeds reached by those brave enough to compete in the NHL, and no sport rivals ice hockey for its ability to keep spectators on the edge of their seat for a full sixty minutes. The sheer speed at which the sport is played means that even the best players only compete for minute shifts at a time, with the action capable of shifting from one end to the other in a matter of seconds. In keeping with the exhilaration of regular time, there is no room for draws in ice hockey, as overtime and penalty shots ensure one team always goes home a loser. In an age when Ashley Young is winning penalties for being tripped up by a gust of wind, ice hockey players provide a refreshing escape from the diving and play acting we are exposed to in the Premier League. Ice hockey players are as tough as they come, and the phrase ‘leaving it all out on the ice’ can be vouched for by the majority of players with gaps in their teeth. As if this wasn’t enough, not only are the body checks frighteningly colossal, but fighting is also considered part of the game. Even if you don’t have a clue what’s going on, the sudden break out of a fight is guaranteed to capture anyone’s attention. Is it outrageous? Of course. Is it acceptable? Probably not. Is it entertaining? You’d be lying if you said no. At the end of all this, the Stanley Cup represents the most demanding playoff format in all of sport. 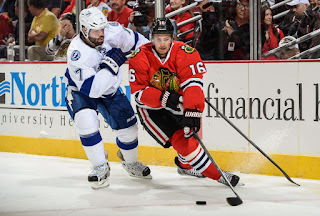 Tonight, the Chicago Blackhawks and Tampa Bay Lightning will play the first of a seven game series, having already played a gruelling 201 games between them since October. Their route to the final has been the ultimate test of mental and physical strength, but this will be no consolation to the team that has to walk past Lord Stanley a loser. So if this article hasn’t quite convinced you, stay up until 1:00am tonight and let the two best teams in the NHL this year win you over. One thing’s for sure, you won’t be left disappointed.